Researcher at King Abdulaziz City for Science and Technology (KACST) and project manager of the LibreOffice localization project (Arabization). 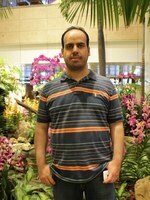 Abdulrahman has more than 9 years of experience in conducting research mainly in cyber security. He is currently the program director of the Saudi national program for free and open source technologies that aims to promote FOSS in the local community and localize necessary applications to the benefits of the Saudi and Arabic community. Abdulrahman is looking forward to share ideas and experience about open source technologies and it's adoption in the Saudi local community, he also will talk about the Saudi LibreOffice localization project.